Dense fog developed over Missouri on Tuesday 19 September and Dense Fog Advisories were issued. The animation above shows the hourly development of GOES-R IFR Probability fields; values increased from northern Missouri to southern Missouri as dense fog developed, first north of I-70, then south into the rest of the state. The morning of 19 September was mostly devoid of mid-level and high-level clouds over Missouri (exception: west-central Missouri starting after 0900 UTC), and that kind of night means that traditional methods of fog detection work well. 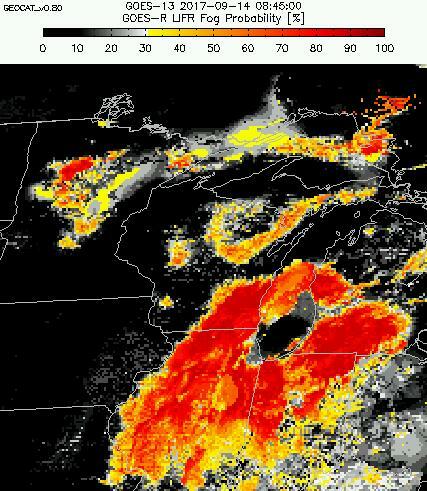 The brightness temperature difference field between the shortwave Infrared and the Longwave Infrared (3.9 µm and 10.3 µm on GOES-16, 3.9 µm and 10.7 µm on GOES-13) shows the fog development. Note that the IFR Probability field, above, does not show fog dissipating around sunrise. That’s in contrast to the Brightness Temperature Difference field below. As the sun rises, the amount of solar radiation at 3.9 µm that is reflected off the clouds increases; this changes the brightness temperature difference from positive (cyan in the color enhancement shown) to negative (grey or black in the enhancement shown). GOES-16 has better spatial resolution than GOES-13; thus, the small valley fogs that can develop in the rugged (ish) terrain of southern Missouri are resolved in GOES-16, but not in GOES-13. When GOES-R IFR Probability is created using GOES-16 data (slated to begin in late 2017), the resolution improvements in GOES-16 will migrate to IFR Probability fields. 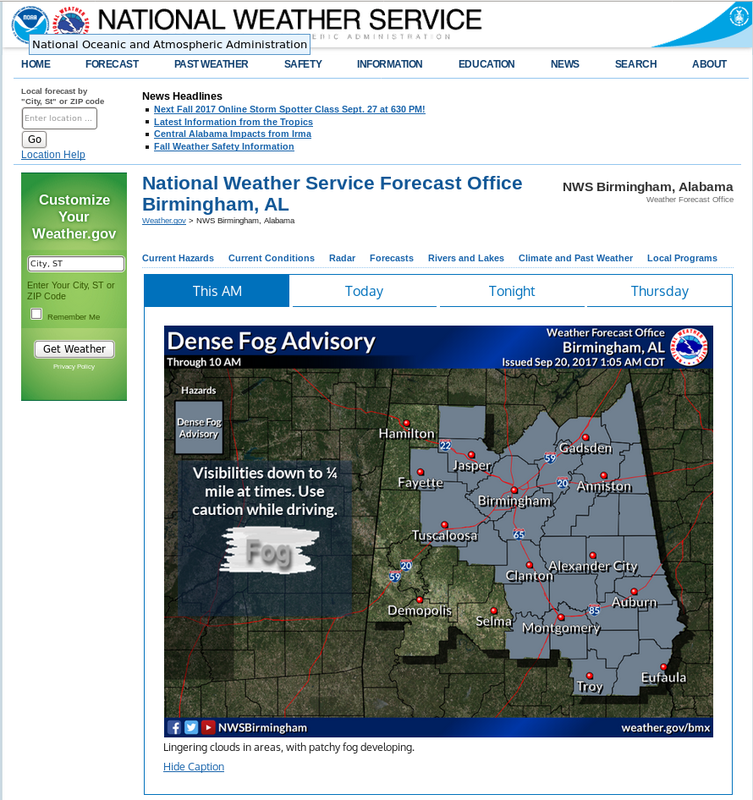 ==========================================================On 20 September, Dense Fog developed over Tennessee and Alabama, leading to the issuance of Dense Fog Advisories. The GOES-R IFR Probability field, below, shows good agreement between high probabilities and reduced ceilings/visibilities. As on the 19th over Missouri, top, this was a night with relatively few middle- and upper-level cloud decks. 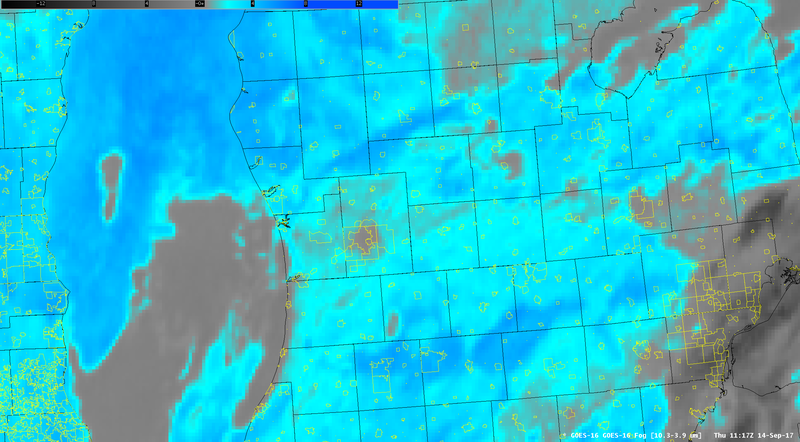 On such nights, the GOES-16 Brightness Temperature Difference field can capably identify regions of stratus (it’s up to a human to decide if the stratus deck extends to the surface; on this night, much of the stratus did). The 2-hour animation of Brightness Temperature Difference, below, highlights two particular strengths of GOES-16: Better spatial resolution that allows small valleys to be sampled correctly, and good temporal resolution (every 5 minutes vs. every 15 minutes for GOES-13) that allows superior monitoring of the cloud evolution with time. Note that the rising sun is eroding the GOES-16 Brightness Temperature Difference signal by the end of the animation below. The Brightness Temperature Difference field (10.3 µm – 3.9 µm) is a key component to the Nighttime Microphysics Red/Green/Blue Composite. As the toggle below shows, the Brightness Temperature Difference field overwhelmingly controls the region identified by the RGB as one with a potential for fog. This entry was posted in Deep South, GOES-16, Plains on September 20, 2017 by Scott Lindstrom.